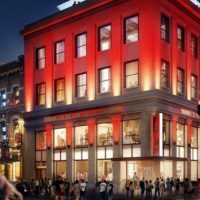 Ryman Hospitality PropertiesBlake Shelton‘s Music City location of his signature restaurant and bar, Ole Red Nashville, will celebrate its grand opening the week of CMA Fest, June 6-10. Blake himself will kick off the festivities with a late-night, all-star concert after the CMT Awards on Wednesday, June 6. Fans can enter to win a chance to attend the show online. You’ll also be able to stream the first three songs on Ole Red’s Facebook page. The 26,000-square-foot venue is the second in the Ole Red chain, after the one in Blake’s hometown of Tishomingo, Oklahoma. A third location is set to open in Gatlinburg, Tennessee next year.